Working alongside biologists in the rainforest of Brazil, Costa Rica, Peru and French Guiana Kannisto captures the wondrous species of the tropics. Using scientific methods and tools, such as a white backdrop, the photographer questions the almost futile attempts of science to document and catalogue the chaos of nature. She carefully directs and construct a scene where nature is barely visible. Her works suggest beauty and the inadequate attempts of science and photography to record the chaos of the rainforest. Sanna Kannisto was born in 1974 in Härmeelinna, Finland. She studied photography both at the Turku School of Art and Communication and at the University of Art and Design in Helsinki. 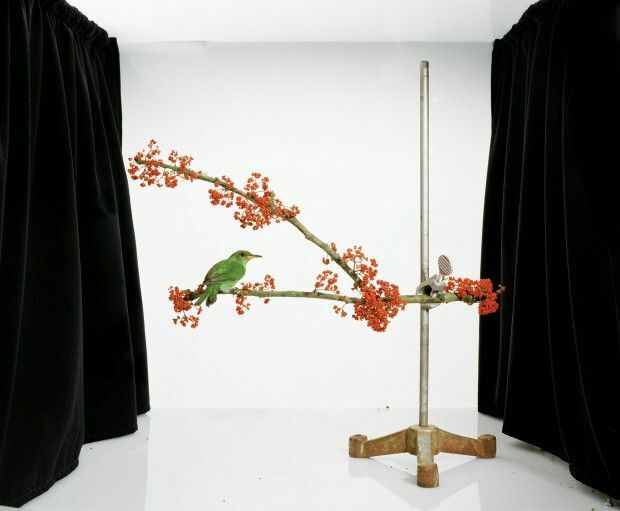 Kannisto constructed her own portable photography box where she carefully directs scenes from nature. The box functions as a stage where she shows objects that have been taken out of their original settings, instilling them with higher importance. The white background suggests scientific recording and documentation. ‘As an artist I am attracted by the idea that when I am working in a rainforest I am a “visual researcher”’, is how Kannisto states her practice as an artist. Photographer Sanna Kannisto has focused on plants and animals in tropical rainforests for years. She has gradually accumulated an impressive body of work that examines, in a style both rigorous and delicate, not just the wondrous species of the tropics but the metaphors of seeing, science, photography and art. Her work presents us with a collection and a theatre; it focuses attention on plants and animals that one could only hope to see in their natural habitat, and even more miraculously reveals and unleashes the mechanisms of this theatrical presentation wherein lie its two wonders.